Thinking Out Loud In Sturbridge: Hmmm...You think? Just a thought, but it could raise some cash for the sidewalks, and over 5 years,or so, could pay for the whole thing. There is always a way to pay, just need to think on it, and market it just right. Good idea, Wally. You sure are a good sport! LOL! I think they would engrave anything if it was accompanied by a check! 'Saw the bricks at the common today. 'Wished I'd been able to ask the bricklayers a few questions, but had no opportunity to do that. 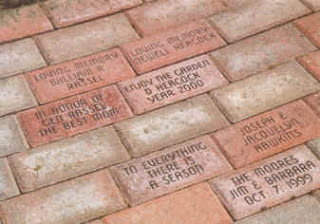 How'd we get the bricks so quickly? So, who used the "credit card" already, and, more importantly, who is going to pay the bill? Oh yeah, maybe somebody already took our money and paid the bill? Oh, never mind, the BOS said it wouldn't matter anyway. So I guess it's no big deal, right? Let's see... so if we do, say, 10 little unfunded projects like this, at approximately $200,000 each...um, let me see...10 x $200,000 comes up to...um...2 Million Dollars...GULP! Maybe someone should tell the members of the BOS who voted to spend the money, poor things. Perhaps they just don't get it.